When 16-year-old orphan Tessa Fell's older brother suddenly vanishes, her search for him leads her into Victorian-era London's dangerous supernatural underworld. I faltered midway through and read three other books before finishing it. I'd had enough of the writing style for a while, maybe. Still, the characters pulled me back in quite quickly. I read the final 200 pages in 2 hours, completely unaware of turning the pages. So new setting, new characters! Should mean a great new riveting book right? Right...? Apologies to all the big, big Clare/Shadowhunter fans but honestly, this book just didn't work for me. I felt like we were back in the first TMI with a choppy story line, really slow and dull (and ridiculously irritating) character development. and loads of plot holes. Reading this with friends, we had a lot of theories and guesses bouncing around. And my biggest issue was even the most ridiculous, nonsensical theories seemed reasonable for this book. Because after the big plot twists in the first 3 TMI books (which I never would have thought possible for a YA book) who the frick knows what Clare is thinking. The characters: By the end of the book I loved Jem and Sophie and Charlotte and Henry. And that's about it. I never thought any character could irritate me more than Jace and yet Will most certainly takes the cake. He is relentless and frustrating and could use a great big kick in the nether regions imho. Tessa I just found incredibly dull. Even when she is learning powers and bouncing around with vampires and demons, she made it seem dull. The other side characters I didn't really get much of a feel for. I disliked the obviously bad characters but that was as far as it went. The plot was fine. I wish is didn't feel so much like a repeated/slightly varied plot as [b:City of Bones|256683|City of Bones (The Mortal Instruments, #1)|Cassandra Clare|https://images.gr-assets.com/books/1432730315s/256683.jpg|2267189]. 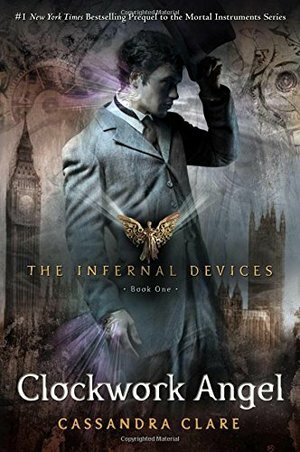 I also wish the 'clockwork angel' actually had more to do with the plot. Because, you know, that's the book's title and all. I really liked the world building. I find it super interesting to have all the world-building elements from the previous three books presented in a fresh and curious setting. I think all the Shadowhunter/Clave/Underworld elements were presented really well. But it didn't really combat the dullness of the rest of the book. Overall, I think Clare just has really weak first books. I'm hoping [b:Clockwork Prince|10025305|Clockwork Prince (The Infernal Devices, #2)|Cassandra Clare|https://images.gr-assets.com/books/1460477747s/10025305.jpg|6674845] picks everything back up and concentrates more on a well written, interesting story rather than outlining everything in the really not-so-great way. Unfortunately, I had to return it to the library for someone else. I don't know if I'll go back to it. I find the angel aspect offputting.